The Daily Chow: UFC 109 and My Sports Weekend is Here! UFC 109 and My Sports Weekend is Here! Much ado has been made about my mecca of sports weekends that's finally here and it starts with tonight's UFC 109. I remember for UFC 107, I was torn between Diego Sanchez and BJ Penn, not out of love but because I can't stand the cocky'ness from either fighters. In fact I think I was hoping that they would somehow both cause each other to implode. With UFC 109, I'm once again pulled in many directions when it comes to the main fight card, as I absolutely adore the heart and skills between these two Hall of Famers. I remember watching UFC 93, when Dan Henderson took a controversial lost, by split decision to Rich Franklin. But the main fight that stuck in my head from 93 is when Coleman fought Shogun and lost by TKO after 3 absolutely winding rounds between the two. I think that's why I never really took to Shogun, despite his talent, humility and dedication, which was because it was quite painful watching one of my favorite HOFs go down (though both were quite drained throughout the fight). Couture Couture Couture, what can be said about another one of my favorite fighters aside from that I'm actually leaning towards him for this card. As for the remaining card that I care about, my picks are circled above. I want Nate Marquardt to win so that he has a chance at the title for whoever wins between Silva and Belfort. 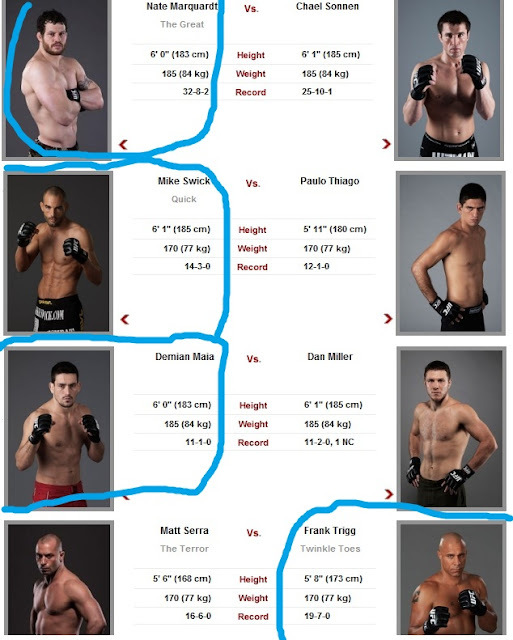 As for Swick and Thiago, I can go either way really but I'm just going there with who I think will win. Demian Maia, man oh man my main man, after his last fight and horrible knock out, I'm looking for him to redeem himself! Though I may not adore mr. Twinkle Toes Trigg, I can't stand Matt Serra and his trash talking so there we have it. You'll find me at the Corner in Downtown SD tonight so HOOORAH and let the sports weekend begin!